Readers of News 192 July 2014, will be aware that we wrote to the Chief Inspector of the Office of Nuclear Regulation asking him to revisit the ONR’s revised proposals in the light of the International Atomic Energy Agency’s Guidance which is based on ‘consideration of an extreme accident‘ ( and not merely a ‘reasonably foreseeable radiation emergency’). We sent the Inspector’s reply to the East Anglian Daily Times, which printed the following account. 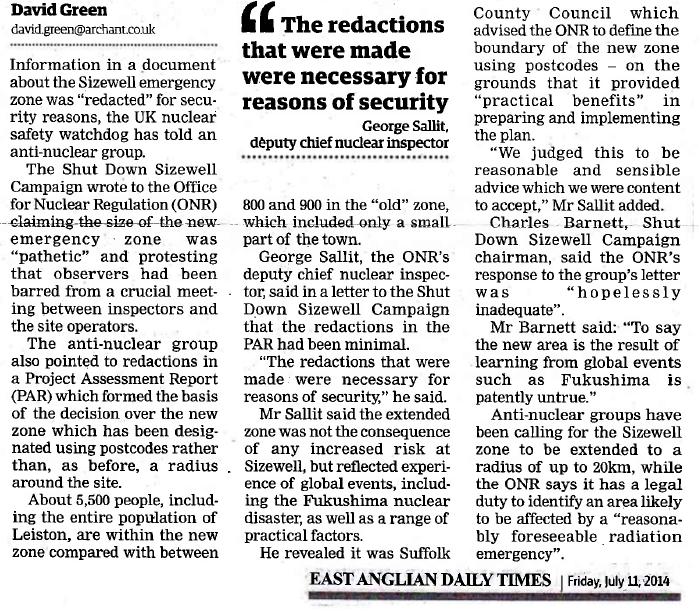 However the above report (as printed) fails to mention the key requirement in deciding the boundaries to the Sizewell emergency plans, as posited by the International Atomic Energy Agency’s Guidance, post Fukushima, nanely: ‘In preparing emergency plans consideration fo extreme accidents should be observerd‘. All that the ONR has done is to meekly abide by the out-dated requirements of the Radiation Emergency Preparedness and Public Information Regulations 2001 (REPPIR), the current position in law. In the light of the present government’s eagerness to suppress any information which is to the detriment of the nuclear industry (see later) it is unlikely that any revision to REPPIR will be in the interest of enhancing public safety;… rather mitigating the responsibilities of the nuclear industry. Shameful! September 4, 2014 in Newsletter 193 - September 2014.